Today I put on a cute outfit, went to the dentist and had three cavities filled, scrubbed the upstairs bathroom (full), cleaned the downstairs bathroom (half) vacuumed all the rugs, swept everything, laundered the linens, dusted, laundered the clothes (three loads), washed dishes, folded the clothes, made dinner, participated in my local government while simultaneously being at my job, laundered bath mats and updated my company’s website. I had it all! Work! Career! Man! Home! Clean teeth! And it all kind of sucked. I felt so alone. Everywhere I turned, someone was snarking, either directly at me or in my direction. I sat through an hour-long meeting where a woman shouted about bags of leaves on the curb, zoning laws, and possibly some combination of the two. I sat patiently while Ian sulked about the car even though his sulking makes my guts rot from anxiety. I sat patiently while my father-in-law ranted about banks and how too many people destroy old beautiful homes. And I did this all without screaming, “Shut up, shut up, SHUT UP!” because I am a lady. But inside, I’m pretty sure I’m developing an ulcer from the constant stress of trying to make everybody happy. Because if I don’t sweep, the house won’t get cleaned. If I don’t cook, everybody eats garbage in front of the TV. Being a reporter means going where the news is, whether it’s a city council meeting or a murder scene, so I am constantly on high alert, waiting for the phone to ring. My boss, Jim, remarked the other day that I try too hard to be helpful, which often shields other people from blame and piles it on my doorstep. This is very true. Because I’ve learned that if I don’t try to fix it, I get blamed by the party I’m shielding, and if it doesn’t actually get fixed, I get blamed by the original party. It’s like being the middle child at work and at home. It’s like being asked to do sorcery. Arlene would say to grin and be pleased that I have a job and a home and a man to take care of (in my case, two). But f*** if I don’t want a day where no one snarks at me, where someone helps me carried my load, where I’m not asked to constantly asked to explain away or shoulder what feels like the entire world. Tonight I’m embarking on one of my absolute favorite dates with two of my absolute favorite people–that is, my boyfriend Ian and my friend Eeon of CannedLaser are joining me to see the rebroadcast of Best of Rifftrax Live: Plan 9 From Outer Space. Quick word about Eeon–he’s the funniest person I know, only because I don’t know Mike Nelson of Mystery Science Theater 3000/Rifftrax in real life, even if he does occasionally reply to my Tweets, which makes my heart flutter, because I am a nerd. Eeon and I have known each other since college and are absolute proof that men and women can just be friends. We’re pals. His wife is wonderful. He let me give the speech from Independence Day at his wedding and let me guest podcast with him and his co-host, Pete, who is also hysterical. But tonight is also the end of 30 Rock, which, along with MST3K and The Shield, can be credited with fundamentally changing my life. 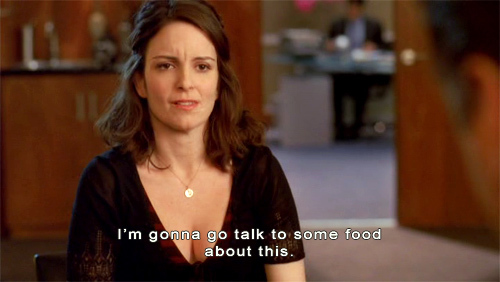 Liz Lemon taught me that it was okay to be a geek and to love junk food and to look fab eating Cheesy Blasters, (even if she didn’t think so) I was torn between two of my strongest nerd loyalties . . . and ultimately, decided on Rifftrax, because it means I get to go to Bomber’s Burrito Bar afterwards. See what I mean? That’s Liz Lemon’s doing. Because I’m going out, I faced a geek dilemma–do I dress to impress MST3K fans by sporting my slightly oversized red JOIKE sweater (styled after the one given to Mike by Gypsy in episode 521, Santa Claus), or do I dress to impress one/both of my dates by wearing something cute and nice? Skirt or jeans? Where do leggings fit into the picture? The JOIKE sweater is wool and it’s cold outside, what does that count for? I decided on the JOIKE sweater, a long fitted top underneath (like a bandage skirt) and Mossimo floral patterned leggings with Doc Martens. Is it the most stylish, flattering, feminine outfit I own? No. But will it make my dates feel comfortable and at ease when we’re eating nachos at Bomber’s Burrito Bar afterwards? Probably. No one likes being overdressed and no one likes a high-maintenance girl. The sweater is appropriate for the occasion and the weather, and might even earn me a few compliments from fellow Rifftrax geeks. And besides, it’s sexier than a Slanket. Goodbye, Liz Lemon . . . I’l miss you.